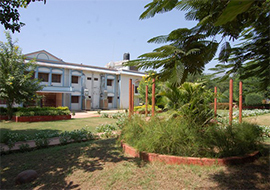 A Separate Air Cooled Hostel block exists in the campus itself. It has been designed meticulously to fulfill the requirements of children of all age groups. 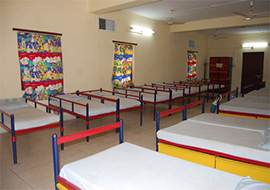 It includes separate dormitories for Juniors and 4 Bedded rooms for Seniors. 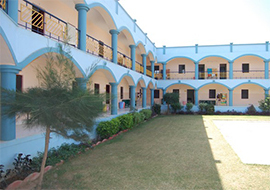 The Junior dormitories are adequately spacious having attached wash rooms, changing rooms and toilets with the provision of only 11 students per dormitory. Seniors are accommodated in Four bedded rooms. 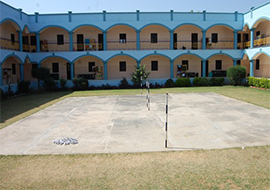 Each child is provided with separate bed, study table cupboard etc. Filtered mineralised drinking water with water cooler is available for 24 hours. 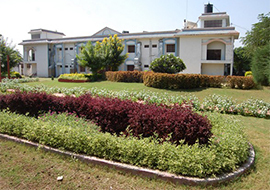 uninterrupted power supply is ensured in the hostel building round the clock with the help of power Generator. 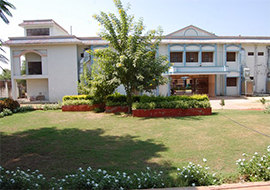 To make proper use of free time the Boarders are provided with common room and in-door game facilities. Residential teachers, who also act as tutors, take prep classes. Each tutor is given the responsibility of 8 to 10 students. He monitors the academic performance of the students and guides them from time to time. Almost care is taken in cooking and serving a well balanced nutritious diet. The school authorities check every meal before it is served to the students. Most hygienic mess has the capacity of 200 students to dine at a time serves pure wholesome vegetarian food. Four meals ( Breakfast with Milk, Morning Snacks, Lunch. Evening Snacks with milk, Fruits and Dinner) are served in a day. Teachers dine with the students and personally look after each student's eating habit. To ensure health and hygiene,food id cooked in modern cooking system. Traditional dishes of various states like Gujarat, Punjab and South are specialty of the Mess. To maintain the high standard of personal hygiene all clothes of children are washed and ironed in the laundry only. Morning Conditioning Exercise, Morning Prep (Supervised Study), Evening Games, Coaching in Various Subjects (by resident Teachers), Meditations, Watching TV. (English News & Selected Serials). Along with these weekly outing,Annual Tour & Excursions during winter break are also organised without fail.